AKA: 1,2-dithiolane-3-pentanoic acid, Thioctic Acid and more besides. Alpha Lipoic Acid is found naturally in our bodies and is both partially soluble in water and in oil (as a cosmetic chemist I can tell you now that this is a pain of an ingredient to solubilise in any phase, it seems to prefer to be at the interface which is good for antioxidant activity but makes it hard to formulate oil only or water only products with this ingredient). Chemically, it was first described as a vitamin-like chemical (was placed in the B vitamin family early on) although now we think of it as more of a co-enzyme with antioxidant qualities, similar to COQ10. It helps to protect the cells from damage and replenish other antioxidants such as vitamins E and C by chemically rejuvenating them in a cyclic reaction quite typical for bodily antioxidants. In a world full of pollution, bad habits and a fear of ageing antioxidants are seen as manner from heaven for skin care brand owners and as such, this little baby has become quite a popular thing to add into your anti-ageing product range. So in days gone by I’d just take a look at the manufacturers data sheets and they usually have a box to tick that says either natural or synthetic. For this one the synthetic box is ticked 100% of the time as while this antioxidant exists all through our body naturally it is very impractical to harvest it from living creatures so instead, since its discovery in 1930 and its isolation in the 1950’s we’ve mostly made it in the lab and then scaled it up in the factory using ‘synthetic’ chemicals. So where do the synthetic chemicals come from? Many brands have taken to using ‘free from’ lists to describe what is NOT in their products. I’ve always had an issue with this way of marketing as it forces brand owners to spend an awful lot of time focusing on what they are not going to use anyway rather than perfecting what they do have. In cases like the one above I even think it becomes slightly absurd but you may disagree and as per usual I accept you are perfectly entitled to do so with or without my permission. Well the most common pre-cursor to alpha lipoic acid is a chemical called 6,8 Dichloro-octanoic acid. That particular chemical does not exist in nature so it has to be manufactured. It is not always the case for this to be manufactured by the manufacturer making the Alpha Lipoic Acid and that’s where my first problem comes. I can ask my manufacturer to disclose their manufacturing flow chart but that’s where our relationship stops. They then have to go ask their manufacturer where the raw materials they buy come from and that’s where things get tricky. An aside – relevant for everything but especially palm these days. When manufacturers give people like me a manufacturing flow chart they are making a declaration about what they do at this time, that is UNLESS they also make a declaration that this is what they intend to do until some particular time point in the future. What this means is that the information given to people like me is not infinitely relevant. Chemical processes change, manufacturing processes change, supply chain agreements change and material origin can change. The further back through the chain we go the more chances for change there are and the less secure any conclusions we build from that will be. When I ask my manufacturer how they make Alpha Lipoic Acid they tell me based on their starting points, not on the ultimate cradle starting point (in a cradle-to-grave style analysis). They do this because this is how it has always been done and this is the only thing they often truly have control over. Now say that my manufacturer accepts my question of ‘yes but where does the 6,8 Dichloro-octanoic acid originate from’ and furnishes me with an answer. At this point we might check WIKIPEDIA to see what Alpha Lipoic cid is made of being as though we are now bored of scanning patents that contain weird sounding chemicals that we have never heard of. 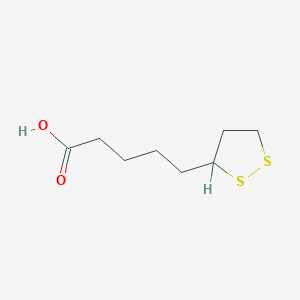 Wikipedia says that Alpha Lipoic Acid is derived from caprylic acid (octanoic acid) and that this particular acid typically comes from animals. Ok so now we have the origins of the ‘is ALA vegan friendly?’ question. Caprylic acid is found in butter, milk and vegetable fats so if, indeed Alpha Lipoic Acid does start off as Octanoic Acid/ Caprylic Acid it’s going to take a few more Q&A’s before we find out if this came from milk, butter, coconut or palm. And with that we have the origin of the ‘does this contain palm?’ question. Simple questions, complicated to answer. Not least because it is entirely possible that Alpha Lipoic Acid did not just derive from Caprylic Acid, at least not all of the time. So I found a patent that discloses a synthetic method of making ALA (Alpha Lipoic Acid) by using 6,8 Dichloro ethyl caprylate as a raw material. I found a few more patents to but I’ll use this as an example. This method takes 6,8 Dichloro ethyl caprylate and reacts it with methanol and tetrabutylammonium bromide. The resulting chemical is then hydrolysed and acidified. Tetrabutylammonium bromide looks like this. This diagram uses simple chemical structure shorthand so the wiggles are carbons and off each carbon that isn’t holding its neighbour would be hydrogens. This is the catalyst so it is important but it isn’t the thing that ends up in the end chemical. I’ve also found another report stating that the 6,8 Dichloro ethyl caprylate can be reacted with sodium sulphide, sulphur and ethanol although that’s not a commercially successful route. Both of these explanations still leaves us hanging though because we don’t know how the main star of the show came into being – 6,8 Dichloro ethyl caprylate. Anyhow, I found our missing chemical for sale by this company. This company also go on to make Alpha Lipoic Acid which, as I’ve stated above, is not always the case. I emailed them to ask if the material originates from palm or animal derivatives. I only did that about 2 hours ago and yet no response so if/ when I do get an answer I’ll let you know. Is quite tricky and that’s putting it mildly. Trying to follow the origin trail for this chemical, alpha lipoic acid, has proved to be quite a challenge for many reasons, not least because once that ‘synthetic’ box is ticked that used to be the end of the conversation and as such, suppliers are not accustomed to digging deeper. One can sit back and say that all this extra knowledge and investigating is making us smarter, making us make better choices, giving us more power to our elbow etc but I question that. Stuck and can no longer see the point. I can see the point when it’s something like Decyl Glucoside – made from reacting glucose from corn with a palm fatty acid as the reaction is quite simple, requires the use of no weird catalysts and retains much of the character of the chemicals of origin in its structure. However, Alpha Lipoic Acid is much more complex in its manufacture, much further removed from nature and, importantly as far as I’m concerned, used in a completely different way to Decyl Glucoside. I’ll quickly expand on that. ALA is an active, typically used at 0.1-0.5% in a formula if it is used at all. It performs a specific ‘restorative’ function that helps protect the skin from oxidative stress. It is biologically active and has no substitute in terms of how this specifically works in the body. Not that it can be used instead of a sunscreen or other more environmentally burdensome active but it’s use on the skin will somewhat strengthen it and make it more resilient which, in turn makes it less needy in terms of maintenance, thus reducing the need to use lots to repair it. On the other hand, decyl glucoside is a surfactant (cleaning agent) that just helps you get rid of grime from the skin. You could use natural plant saponins or a bar of soap instead. While a bar of soap has gone through a chemical process it’s simple and can be done without palm or animal bi-products if that’s important to you. Decyl Glucoside is typically used at 1-15% in formulations as supplied (usually 50% actives in water) so it is a much larger part of your formula. Decyl Glucoside, while naturally derived does not occur in nature. Is there a case for not acting as if every chemical is worthy of the same in-depth origin analysis? I certainly think so, in most, but maybe not all cases. Is there a case for stating ‘Synthetic’ and being done with it? Again, I certainly think so, particularly for ingredients like this that are so minuscule in their usage compared to other things. And with that I sign off. I will let you know if I do get an answer from anyone about the definitive origin of Alpha Lipoic Acid but for now, suffice to say that it could be animal or vegetable with an absolutely guaranteed slice of mineral (petroleum derivative). Beyond that, for tonight, I have had it with this chemical. Oh, and if any of you write in and tell me that you have an answer and it’s from X, Y or Z, that’s lovely but do make sure your manufacturers have signed off on it always being from that source/ origin as without that we are only as good as their present word and can make no guarantees into the future.